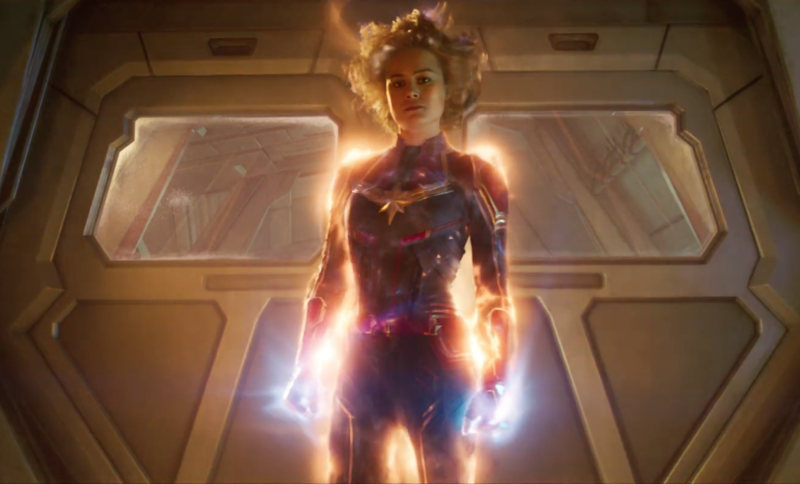 The Brie Larson-starring Marvel movie includes only two post-credits scenes, but both of them hint at big (and even confusing) impacts on the rest of the franchise. Over a decade into its run, the Marvel Cinematic Universe is now deep into its so-called Phase Three, which hits its penultimate feature with Anna Boden and Ryan Fleck’s “Captain Marvel.” The first MCU film to center entirely around a female superhero and the first to be directed by a woman, the Brie Larson-starring film also marks another milestone for the blockbuster series: it’s a throwback! Set in the mid-’90s, the film is tasked with retconning some classic Marvel lore — who was actually Earth’s second superhero? what was Nick Fury (Samuel L. Jackson) like as a plucky young agent? what’s the Marvel stance on Blockbuster Video stores? — and introducing a character who will likely have a big influence on MCU films to come. The film follows Larson as jet-pilot-turned-something-else as she literally crashes back to Earth and is forced to reckon with the provenance of her powers and how she intends to use them. Along the way, she bonds with Fury, reconnects with her past (including Annette Bening as the Kree heroine Mar-Vell), meets a cat named Goose (who is not exactly a cat), changes the script on the long-running Kree vs. Skull kerfuffle, and basically becomes wildly powerful. It’s a stacked origin story, but of course, it must end, and when it does, it offers up two brand-new post-credits scenes to only further push the MCU mythos. “Captain Marvel” includes just two post-credits scenes, but both have big implications for the always-expanding franchise. Here’s what they are and how they tie back to the rest of the MCU. “Captain Marvel” ends with Carol zooming off into the great beyond to, presumably, get moving on some space-set superhero stuff. While it’s unclear if Carol has returned to Earth in the interim, audiences who stuck around for the only post-credits scene in “Avengers: Infinity War” know she’s been called back post-Thanos snap by no less than Nick Fury. Just before he was snapped, Fury activated a beeper that Carol left with him — you know the one, a two-way affair, done up in her classic colors, which she hands off to Fury at the very end of “Captain Marvel” — and the first post-credits scene opens with Fury gone and the beeper still very much activated. Set at the Avengers base, the scene opens with a flummoxed Captain America (Chris Evans) and Black Widow (Scarlett Johansson) watching various screens assess the fallout from the snap, as the numbers of those missing tick steadily upwards. Captain America puts it succinctly: “This is a nightmare.” Next to them, the beeper pings away behind glass. But at least they’re not totally alone, as soon James “Rhodey” Rhodes (Don Cheadle) and Bruce Banner (Mark Ruffalo) join them with news. As Rhodey puts it, “Hey, that thing just stopped doing…whatever it was doing.” The beeper has seemingly stopped transmitting, and the confusion and fear is clear: they have no idea what it was, who it was contacting, or why the hell Fury had it. “I want to know who’s on the other end of that thing,” Black Widow says, and she doesn’t have to wait too long to know. While it’s long been known that Larson would be in the upcoming “Avengers” feature, this post-credits scene indicates that when “Endgame” opens, she’ll already be with the team. Let’s see how that goes. Things get considerably lighter in the second post-credits scene, which zips back to Fury’s ’90s-era office, where none other than Goose the cat (or, well, Goose the Flerken) is hanging out on Fury’s desk. In typical cat fashion, he immediately starts hacking away at a hairball, only to vomit up his prize from the film’s final battle: the Tesseract. While the powerful blue cube has appeared in plenty of MCU films — we know that it was first brought to Earth by Odin, and in the current MCU timeline, it was first seen when Red Skull discovered it during World War II — this adds a new wrinkle to its travels on Earth. It’s still unclear how or when Mar-Vell found the Infinity Stone, but post-WWII, Howard Stark had it, before eventually relinquishing it to S.H.I.E.L.D., who had it until Loki stole it, and it was finally taken back to Asgard. Of course, Thanos nabbed it for himself, a necessary addition to his snap-causing Gauntlet. But did something else happen between Stark’s possession and turning it over to S.H.I.E.L.D.? Or did someone (Mar-Vell?) steal it from the org? Or, wait, is this somehow another Tesseract? Leave it to the cat vomit scene to have more questions than answers.